I picked up Chekhov’s The Duel because I wanted to read it before watching the film version. My copy of The Duel is from a collection of Chekhov’s short novels, and it’s a translation from Richard Pevear and Larissa Volokhonsky. I have a fascination for dueling, and it’s a topic I’ll read about if I get the chance. Imagine getting pissed at someone at work, smacking them back and forth across the face with a pair of gloves, and then … pistols at dawn. Maupassant included a duel in Bel Ami in a wonderful section of one of my favourite novels. The duel takes place between rival journalists, and Georges (Bel Ami) is more-or-less shoved into it. Terrified, he gets drunk beforehand. It’s duel as farce, and when it’s over, exaggeration sets in. In Stendhal’s The Red and the Black, we see the social significance of the duel which must only take place between social equals. You can’t duel with a peasant! Then, of course, there’s Lermontov’s A Hero of Our Time–an incredible novel in which a duel becomes a defining moment for the central character. There’s also Kuprin’s The Duel ; in this book the duel seen as a type of social dominance but it’s also a symptom of the decay of Russian society. Can’t forget, of course, that both Lermontov and Pushkin met their all-too-early deaths as the result of duels. What a waste. Chekhov wrote The Duel while also working on Sakhalin Island. The latter, Chekov’s longest published work is a non-fiction account of life in Siberia’s “most notorious penal colony.” The introduction to my copy, written by translator Richard Pevear, stresses that Chekhov’s experiences at Sakhalin had a profound, although, indirect, impact on The Duel. After reading Chekhov’s The Duel, I have the sense that Chekhov saw dueling as a silly, dangerous social drama, and yet at the same time, the duel that takes place in this excellent novella has some unexpected ramifications…. Laevsky’s question isn’t, of course, theoretical. He’s tired of Nadezhda and wants to get rid of her. The situation is complicated by the fact that Nadezhda’s husband has died, and Laevsky has just received a letter with the news. He’s reluctant to tell Nadezhda as now he’ll be expected to marry her. But he’s asking for advice from the wrong person. Samoilenko is a bachelor and envies Laevsky’s relationship with the beautiful and intelligent Nadezhda. Samoilenko tells Laevsky that “love can’t last long,” and that it’s his “duty” to marry the woman he’s ruined. Laevsky argues with Samoilenko, presenting extenuating circumstances in his effort to get the answer he wants to hear. Eventually Laevsky hits on the idea of borrowing money from Samoilenko so that he can return to his mother in Russia, or even “escape” North and abandon Nadezhda in the process. Samoilenko tries to borrow the money from zoologist von Koren. Von Koren who hates Laevsky sniffs that Samoilenko wants to borrow the money only to give it to Laevsky, and the request sets off a chain of dramatic events. Yes, she loves me to the extent that, at her age, and with her temperament, she needs a man. It would be as hard for her to part with me as with powder or curling papers. I’m a necessary component of her boudoir. Laevsky is very judgmental about Nadezhda. Can she be as bad as he says she is? Laevsky’s dislike of Nadezhda Fyodorovna expressed itself chiefly in the fact that everything she said or did seemed to him a lie or the semblance of a lie, and that everything he read against women and love seemed to go perfectly with himself. The activity of Mr. Laevsky is openly unrolled before you like a long Chinese scroll, and you can read it from beginning to end. What has he done in the two years he’s been living here? Let’s count on our fingers. First, he has taught the town inhabitants to play vint; two years ago the game was unknown here, but now everybody plays vint from morning till night, even the women and adolescents; second, he has taught the townspeople to drink beer, which was also unknown here; to him they also owe a knowledge of various kinds of vodka, so they can now tell Koshelev’s from Smirnov’s No. 21 blindfolded. Third, before, they lived with other men’s wives here secretly, for the same motives that thieves steal secretly and not openly; adultery was considered something shameful to expose to general view; Laevsky appears to be a pioneer in that respect: he lives openly with another man’s wife. In Chekhov’s novella we see the duel as farce, but it’s a worn-out, tired farce. And since this is Chekhov, the author’s humanism will not permit the duel to be but a cruel joke–instead it’s a tragifarce–an event that leaves his characters both mystified and a little humbled by the experience. This looks great, thanks for the review! I’ve been reading Chekhov, Turgenev, Pasternak, and Tolstoy short stories lately, but missed this one. There was an unfortunate dueling scene in Tender is the Night (a book I despised)…I’ve always thought I’d back off, saying “wait, wait…nevermind, not a big deal!! !” Duels. Who thought of that? I’d like to read a non fiction book about dueling if you ever come across one. Duels are quite a topic in German literature as well. I think there is a duel in one of the best novels I know, Fontane’s “Effi Briest”. Between “Anna Karenina”, “Emma Bovary” and “Effi Briest” I’ll prefer the latter any day (regarding the story, style is another matter). Your review also made me think of the duel in Barry Lyndon and, of course, in one of my favourite movies “The Life and Death of Colonel Blimp”. This said, I think I need to read this novella. In “The Black Monk” and “Peasants” his portayal of human behaviour is also extraordinary. I wouldn’t mind reading Sakhalin Island either. I’ve heard that Sakhalin Island is a bit dreary, but that didn’t stop me from buying a copy. Effi Briest is wonderful, and the film version is good too–but it’s been a while since I’ve seen it. I have a collection of Chekhov’s stories. I’ll have to see if The Black Monk and The Peasants are included. Thanks for that review. “The Duel”, as I remember, is a relatively early story, and it has been a long time since I last read it. From what I remember, the principal characters are all very vividly drawn with firm outlines, in contrast with his later works, where the characters tend to be presented with a greater degree of ambivalence. Duelling seems a recurrent motif in 19th century Russian literature, for some reason. There’s the duel you mention in A Hero of our Times, and there are also duels in Pushkin’s Eugene Onegin; Dostoyevsky’s Demons and The Brothers Karamazov (in the latter, the duel takes place in the chapters relating Father Zosima’s early life); Turgenev’s Father’s and Sons; Tolstoy’s War and Peace; and there’s an offstage duel during the final act of Chekhov’s Three Sisters. I really don’t know how to account for this seeming obsession with duels that the Russians seem to have. 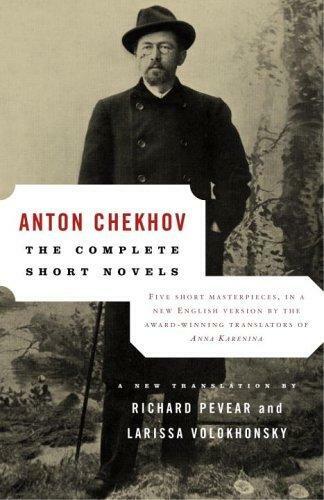 Chekhov wrote so many wonderful short stories that it’s impossible to pick out a favourite. Three Years is one I often return to, although I suppose it’s long enough to be called a novella. Perhaps the most striking of the stories is “In the Ravine” (sometimes translated as “In the Hollow” or “In the Gully”), with a horrific climactic scene that wouldn’t be out of place in a Zola novel. I wonder how “Russian Roulette” fits in with dueling? I checked my copy of Chekhov stories and it includes “In the Ravine.” Haven’t read it yet. In France, the fight against duels started in Louis XIII time. I heard a radio program lately, Cardinal Richelieu was strongly against duels and made the king forbid them. I think Proust fought someone in a duel. Can you imagine him? I can’t. The review of this short novel (which brought back memories of Gogol’s The Squabble for me) is a reminder that the Russian “Greats” all seemed to write short stories, novellas, short novels, novels and epic novels. And while they were better at some forms than others, they were very good at them all. Now to be sure, some of them did that out of economic necessity to settle their gambling debts, but that doesn’t explain the consistently high quality. Edith Wharton and Henry James did the same thing, so it is not entirely foreign to English language fiction. But it does not seem to be something to which contemporary authors aspire. Perhaps the best indicator is that New Yorker short fiction (just about the only lucrative venue left) from established authors now mainly consists of excerpts from forthcoming novels. I used to read the New Yorker regularly but don’t any longer. It wasn’t a choice as much as a slipping away. You bring up a good point, though, most contemporary authors who write short stories and novels (let’s say) seem to do one significantly better than the other. Laurie Colwin was an exception though. Her novellas, short stories and novels are all top notch. Guy: Did you know that Melville House is putting out The Duel X 5 this August — five novellas, all titled The Duel? This one, plus Casanova, Conrad, Kuprin and von Kleist. Details are on their website. I’m tempted, just because I like the notion of five books with the same title and format, but by different authors, lined up on the shelf. No I didn’t know so thanks for the tip. I’ve read Casanova’s and Kuprin’s The Duel–well and Chekhov’s. I’ve read some von Kleist but not his The Duel. So with that and Conrad… Thanks! The Casanova Duel I have is a split between an excerpt from his memoir and a fictionalised account of the dueling episode. Why are Melville doing this to me? Thanks also Kevin. So much for my budget / buying restrictions. I see they’re doing a series of Derek Raymond as well. Aren’t they the ones doing a subscription (off to look next) because I considered it but then I already have some of the books on offer. What a fascinating idea! I have only read the Chekhov & the Conrad. The Conrad story formed the basis of an early film directed by Ridley Scott – The Duellists, with Keith Carradine and Harvey Keitel. Rather a good film, as I remember. Yes you’re right. It’s a great film and I’ve been meaning to get back to it, but tonight, I am watching the film version of Chekhov’s The Duel. I have so many others to read before I can turn to this, not least Onegin, Pechorin and Turgenev. Well, I’ve read Pechorin of course, but not the others as yet. That Melville House series does sound interesting. I’ll probably pick this up in that, although not until I’ve read some of the others first. Regarding Dumas The Three Musketeers has plenty of duels, both pre-arranged and impromptu. They tend to be bloodier affairs than popular culture gives us cause to imagine with characters often spending months afterwards recovering (and lesser characters dying). Chekhov was a descendant of serfs himself, which may account for giving Laevsky that preoccupation.